The Neptune Beach Pearl will be heading to the 2015 California Collegiate League Playoffs as the North Division Champion! 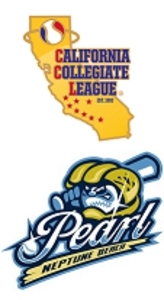 With still a week left in the regular season the Pearl have locked up the division title and will head to San Luis Obispo for the playoffs the weekend of July 31st-August 2nd. The playoffs is a Double Elimination format. Last year the Pearl reached the playoffs as the league's Wild Card winner and finished in 2nd Place after losing to the the LA Brewers in the championship. All playoffs games will be played at the home of the San Luis Obispo Blues (Sinsheimer Park). Game times and matchups to be announced in the coming weeks.